BANFF, AB, Nov. 21, 2016 /CNW/ - Banff, Alberta has been named to National Geographic Traveler magazine's Best of the World list which highlights 21 must-see places to visit in 2017. Announced Thursday, Nov. 17, Banff is the only Canadian destination named to the list and is on the magazine's cover with a photo of the iconic glacial-fed Moraine Lake situated in the Valley of the Ten Peaks within Banff National Park. The 21 destinations were chosen by Traveler editors. The full list can be found in the December/January 2017 issue of National Geographic Traveler magazine, available on newsstands starting November 29, and online now at http://www.nationalgeographic.com/travel/features/best-trips-2017/. "It's no secret that 2017 marks Canada's sesquicentennial celebration of cool. But we love Canada for little reasons as much as landmarks and milestones. So our story is about how an outward journey to Banff leads to an inner sense of happiness. The magic comes from person-to-person interactions with big-hearted Canadians, from First Nations community leaders to horse-packing cowboy guides to park rangers to some of the country's newer citizens, who hail from foreign lands but find a happy home in Canada. We aimed to honor the inclusive feeling of Canada, a warm embrace that brings a human-scale equivalent to those majestic landscapes," said George Stone, National Geographic Traveler editor-in-chief. 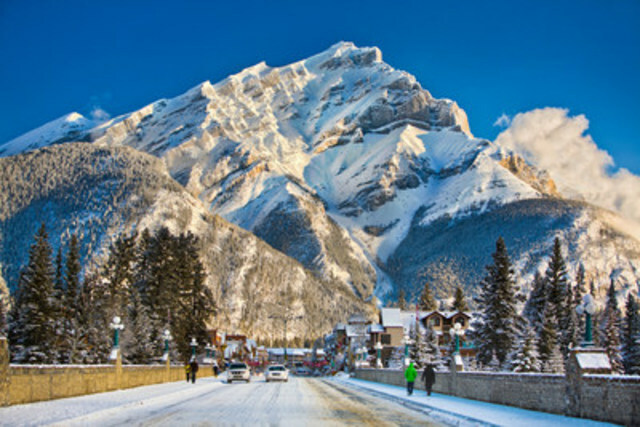 "I am thrilled Banff, Alberta has been named to National Geographic Traveler's Best of the World list," said Ricardo Miranda, Minister of Alberta Culture and Tourism. "This is a prestigious honour and we could not be more thrilled with the recognition of our province. Alberta is a place of incredible scenery, people and spirit. We wholeheartedly agree that Banff is one of the world's must see destinations. It is one of many locations in the Rocky Mountains and Alberta that offers visitors a great vacation experience. Congratulations and well done, Banff and Alberta!" "We are excited to share our destination with the world and are proud to be recognized by National Geographic Traveler as a place you need to visit in 2017," said Leslie Bruce, President and CEO of Banff & Lake Louise Tourism. "We hope that visitors will come and enjoy the array of incredible experiences in Banff National Park all year long. Each season brings a unique range of activities and breathtaking scenes." "Parks Canada is a leader in natural and cultural tourism and we are all very proud of this recognition. Banff National Park is the birthplace of Canada's national park system and an exciting four season destination. In 2017, for Canada's 150th anniversary, admission to all national parks will be free and I encourage all visitors to discover what makes each of Canada's 46 national parks unique and among some of the best destinations to visit in the world," said Catherine McKenna, Minister of Environment and Climate Change and Minister responsible for Parks Canada. National Geographic Traveler (six issues per year) is the world's most widely read travel magazine and has 16 international editions. The National Geographic Travel Digital Group shares its inspiring and authoritative digital content, such as trip ideas, photo galleries, blogs and apps with its @NatGeoTravel community of over 20 million. To learn more about each destination visit: http://www.nationalgeographic.com/travel/features/best-trips-2017/. National Geographic Partners LLC, a joint venture between National Geographic Society and 21st Century Fox, combines National Geographic television channels with National Geographic's media and consumer-oriented assets, including National Geographic magazines; National Geographic Studios; related digital and social media platforms; books; maps; children's media; and ancillary activities that include travel, global experiences and events, archival sales, catalog, licensing and e-commerce businesses. A portion of the proceeds from National Geographic Partners LLC will be used to fund science, exploration, conservation and education through significant ongoing contributions to the work of the National Geographic Society. For more information, visit www.nationalgeographic.com and on Facebook, Twitter, Instagram, Google+, YouTube, LinkedIn and Pinterest.